Prince William and former British prime minister David Cameron attended a meeting in which a vote-trading deal for the right to host the 2018 football World Cup was discussed, according to an official FIFA report. The so-called Garcia report into the decision to award the 2018 and 2022 World Cups to Russia and Qatar was published on Tuesday, outlining that Prince William and Mr Cameron were present when a deal to swap votes was discussed between England and South Korean officials at a Zurich hotel in 2010. The Queen has also been mentioned in the report after it emerged a member of FIFA's executive had sought an audience with the British monarch during the bidding process and was seeking a knighthood in exchange for helping England's bid. 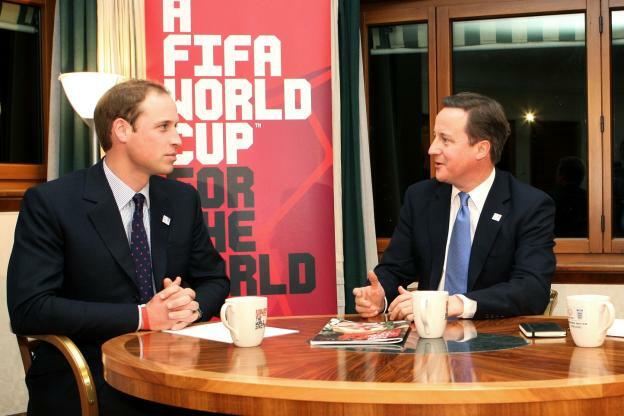 The Zurich meeting attended by Prince William and Cameron in December 2010 also included FIFA vice-presidents Geoff Thompson and Chung Mong-joon, who were representing England's 2018 bid and South Korea's 2022 bid respectively. "The Prime Minister asked Mr Chung to vote for England's bid, and Mr Chung responded that he would if Mr Thompson voted for Korea," the report read. "Mr Thompson, who said he had been thinking about voting for Korea even before the meeting with Mr Chung, agreed." Mr Chung denied the allegation, but "acknowledged" he met Mr Cameron at the G20 Seoul Summit in November 2010, but said he never discussed "any voting agreement". The report, compiled by FIFA's former chief ethics investigator Michael Garcia in 2014, said Mr Thompson "was the only member of the FIFA Executive Committee who admitted reaching an agreement to trade votes". It also stated the swapping of votes was a "violation of the anti-collusion rules". Mr Thompson had not believed Mr Chung voted for England, which was eliminated after receiving just two votes in the first round. FIFA said it had decided to publish the Garcia report after it was "illegally leaked" to a German newspaper. "For the sake of transparency, FIFA welcomes the news that this report has now been finally published," FIFA said in a statement. Mr Garcia, who is now an associate judge at the Court of Appeals for the state of New York, spent 18 months and interviewed 75 witnesses as he investigated the convoluted bidding process for the two tournaments. His report was not published but instead handed to the then FIFA ethics judge, Hans-Joachim Eckert, who issued a 42-page summary, which said there was not enough evidence to reopen the bidding process. Mr Garcia publicly criticised Mr Eckert's summary and resigned one month later, in December 2014. FIFA then agreed the report could be published once all investigations against individuals had been completed. FIFA's situation took a dramatic turn in 2015 when several dozens football officials were indicted on corruption-related charges in the United States, while the Swiss Attorney-General's office opened a criminal investigation into the award. Former FIFA president Sepp Blatter was later banned for six years following an internal ethics investigation.